Employee motivation is not just a fancy term that management tosses around when workplace morale and performance take a plunge. It’s a powerful force that can either spark customer service, productivity, and performance or destroy them. As a manager, when you understand and activate employee motivation, you unleash its power to energize and transform the workplace. 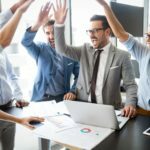 Employee motivation is a psychological force that energizes employees and directs their behavior toward the achievement of organizational goals. 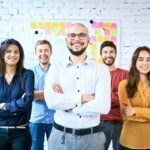 This powerful force increases productivity, enhances customer service, and ensures optimum performance at the individual and organizational levels.1 Not only does motivation have the power to unleash performance excellence, but it when it emerges, it invigorates the workplace through its four signature qualities. Energy – Motivated employees exert a higher level of energy and vigor in their tasks, projects, and assignments.3 They increase effort when faced with a higher volume of work. Perseverance – Motivated employees demonstrate a steadfast persistence in job-related tasks even in the face of challenges.4 Their high energy levels give them the strength to plow through obstacles. Mental Engagement – Motivated employees not only work hard, but accomplish their work with understanding, intelligence, and sound judgment.5 They are not robots that carry out commands. Instead, they engage their minds and add value as they carry out their mission. Drive – Motivated employees focus on achieving their priorities—the goals that drive their motivated behavior. However, their goals and priorities are not always aligned with organizational priorities, objectives, and values.6 Therefore, keep your eyes on the fruit of people’s drive to ensure it’s not counterproductive. These four qualities of employee motivation create a vibrant and productive workplace. As a front-line manager, you are in a prime position to unleash the powerful force of employee motivation to create a better workplace, drive performance, and achieve results. Interesting and Meaningful Work7 – Help employees see the meaning and value of their work and how it contributes to a greater good. Assign tasks that are varied, interesting, and challenging. If the job is repetitive by nature, find ways to break up the monotony. Recognition and Feedback8 – This goes far beyond formalized employee recognition programs. It involves creating a culture of appreciation, recognition, and ongoing feedback that’s marked by honesty, support, and sincere desire to see others succeed. This culture starts at the top but involves all levels of the organization. Employee Involvement9 – Engage employees in decision-making and problem-solving when appropriate. Getting employee input as you move the organization forward secures their ownership of and commitment to the organization’s success. Working Conditions10 – Create a high-quality workplace in terms of the physical, social, and psychological impact it has on people. Promote a safe and healthy work environment where employees can thrive. Make the physical environment pleasing to all the five senses, and focus on ensuring people are excited to come to work. Strong Leadership11 – Strong leaders are the cornerstone of employee motivation, engagement, and performance. Managers and supervisors hold the keys to shaping the work environment. Invest in providing them with the necessary training, tools, other support, and accountability to help them create a great workplace. Company Policies and Environment –Krüger and Rootman focused on having comprehensive policies and systems that “ensure a clear understanding and equitable treatment of employees.”12 This speaks to ensuring policies and procedures are fair and transparent. Employees need to know up front what it takes to reap the available perks and rewards, as well as what they need to avoid. Focusing on these seven elements will help you activate the powerful force of employee motivation to ignite customer service, productivity, and performance. It will also create a thriving workplace, where people are free and happy to bring their best. SYLVIA MELENA is the Founder and CEO of Melena Consulting Group and the author of Supportive Accountability: How to Inspire People and Improve Performance. Small Business Managers Influence Employee Satisfaction and Commitment?” Acta Commercii 10, no. 1 (2010): 59–72. DOI: https://doi.org/10.4102/ac.v10i1.114. Retrieved from: https://actacommercii.co.za/index.php/acta/article/view/114. Date accessed: December 16, 2017. Creative Commons License: https://creativecommons.org/licenses/by/4.0/. Nienaber, R., M.H.R. Bussin, and C.
Henn. “The Relationship Between Personality Types and Reward Preferences.” Acta Commercii, 11, no.